I wanted to say that our experience was very much exceptional with Adaptive! As with any project, there will always be some "up's and down's", but at the end of the day what really matters will be the overall customer support and end product. Those two items, your crew went very well above and beyond on. You delivered drawings that showed exactly what we were to expect, and the end result showed that and more. You managed your guys very well, and when you said something would be taken care of.. it was. That went above and beyond any expectations we had set. We can not wait for the next project we plan on doing with Adaptive! -BRENT F.
I want you to know how very happy and pleased I am with the work you and your crews did for me. My master bath is even more beautiful than I imagined it could be. I just go in there and stare at it and pinch myself that it's really done and it's mine! Please tell all your contractors how much I appreciate all their hard work and for answering all my dumb questions. I hope I didn't bug them too much. Most of all, thanks to you for making this happen in such a timely and stress-free manner. I very much appreciated your professionalism and your concern to do the job right. It's very rare it seems to find that combination in the business world today. I felt like you and all your guys were dedicated to making me happy and turning out a quality product. Please don't hesitate to use me as a reference for future potential clients. Also know that I will be giving your name out to my friends looking for a trustworthy contractor. -CAROLYN O. When I told Joseph I wanted a center island in the kitchen with the range, he said "no problem, we could drop the lines through columns." when I told him I didn't want columns he said, "no problem we can cut a channel in the concrete." When I told him I loved our stained concrete floors and didn't want them cut up he said, "no problem, I'll think of a solution," and he did! I couldn't be happier with the attention to detail, timeliness, clear communication and Joseph's positive attitude! As I look around, it's like we got a totally new house. We love each decision that was made and wouldn't change a thing. It was a little scary for us to do a big renovation like this but Joseph made it easy, because of his experience and caring, and he goes the extra step to make sure it's perfect. -FIONA O. We are so pleased with the renovations that were done by Adaptive Renovations. From start to finish Joseph and his team were professional, highly skilled and completed all work in a timely manner. No stone was left unturned and no job was too small. 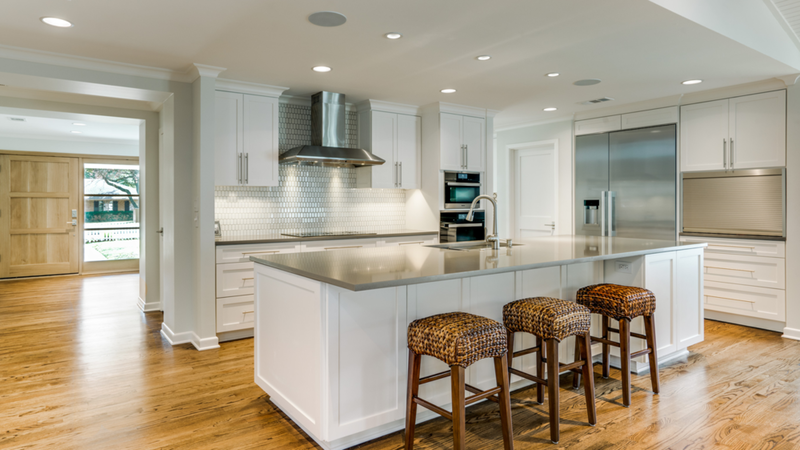 I would recommend Adaptive Renovations to anyone who is looking for a quality experience, quality work, attention to detail and unmatched client care. -ERIN M.
Master bath remodel. Joseph and his crew were extremely helpful, courteous, patient and experienced during the entire project. It went quickly and smoothly. We will definitely use them again. -KAREN C.
We were VERY pleased with Joseph and all of his crew. On time, clean, and concerned with what we wanted out of the project. Would highly recommend! -CHERYL C.
We have worked with Joseph and Adaptive Renovations on two projects at our house, and will always call him for any future project. He is fast, accurate, and honest. He didn't try to up-sell for things we didn't need, and stayed on budget and on schedule. If you ever have a project involving more than one contractor (a plumber AND an electrician, for example), Joseph is the guy to run the project and make sure it's done right. Large projects can always bring unforeseen challenges, but the difference is a contractor who takes responsibility and ownership for the project, and Joseph is that man. We cannot recommend him highly enough. -ASHLEY A. We hired AR to manage our window replacement, refinishing of wood floors, and doorway widening projects. They took care of all the scheduling, overseeing, and communicating, which made it easy on us. Very professional, honest, reasonably priced, and friendly! They did an excellent job! We are more than happy with the results and plan to re-do a kitchen using AR soon. Don't hesitate to use this company- you won't regret it! -JENNY H.
We hired Adaptive Renovations to manage our staircase remodel. It turned out amazing - just like we wanted! And on top of that, it was done ahead of schedule and with very close attention to details. The team of painters and carpenter were very professional, and Joseph would not sign off on the project until every last detail was perfect. We cannot wait to work with AR again in the future! -KRISTIN K.